Hackney resident blogs about life as a tenant and employee of association Family Mosaic and Hackney Council – it makes for pretty hair raising reading! ‘This Council condemns the actions of Westbrook Partners in their approach to the New Era Estate in Hoxton East & Shoreditch Ward. We believe if, Westbrook Partners proceed with their previous plans, it will result in the enforced homelessness of nearly half the estate’s households’. The words enforced homelessness rung loudly in my ears. There were a number of motions brought forward and discussed by Councillors that I felt were relevant to our cases and which I reinterpreted for our cases. Having lived in the properties for either four or five years we were long-standing tenants. The actions by Family Mosaic meant that we were now facing enforced homelessness. We had all taken pride in our homes and made improvements ourselves in one case tackling mice problems, black mould, and alerting the housing manager to domestic violence in the building hence enabling intervention. It was important that our voices were heard. Our time was running out and we had four months before being made homeless. There was no legislation to protect workers such as us from being forced out of our homes. If we were forced to move out of the properties we would then become another homeless statistic in Hackney. We were calling on the Council to help us. From the list of Councillors named at the meeting I created my own list and a colleague and myself attended a surgery on March 7th at Shoreditch library. I believed that the Councillor would be sympathetic as she was one of the Councillors who had brought the motion to the council table. In the dimly lit library room we explained our situation. Our questions were urgent and we wanted to know if Hackney had a policy to assist workers. She said she had never heard of a case like ours and hence did not know but would look into the matter. Three workers were affected by the redundancy. A meeting was held with Unite the Union and we discussed what we could do. 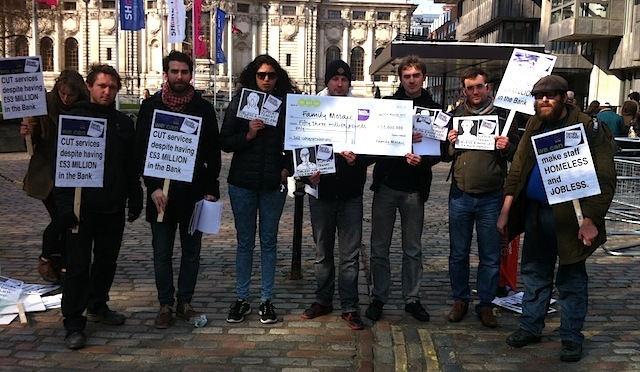 A protest held on March 14th outside the First Steps Homes Show that was marketed as an opportunity to meet the experts and providers of low-cost home ownership schemes in one place. Family Mosaic was one of those companies. They are provided with free accommodation for a small amount of work. What does free mean to you? Free to me means not paying rent. Family Mosaic was not speaking the truth. We all paid monthly rent. We all had tenancy agreements. In addition I worked overtime for no pay. This was not a free ride. To say we were provided with free accommodation was disingenuous. We all paid rent and we all had tenancy agreements. Given the facts it can be said that Family Mosaic got a very good deal. They were paid monthly rent and I was paid below national minimum wage. I found out about the national minimum wage issue after I was made redundant. I worked overtime and was not asked to claim for my overtime. When I told the manager that I was doing overtime I was told to manage my time better or cut the time spent with certain adults. I supported six adults, two of the adults had complex needs. Since December I had supported three of the adults by myself. Overtime enabled me to give all six adults the level of support they required. I was a lone worker and not based in the office. I paid for my travel and worked at home sending my weekly notes. When my computer broke I was sending updates from an internet cafe. Realistically it is fair to say that I funded my own employment. I was a modern day wage slave. As negotiations were not happening with Family Mosaic and we had not heard from the Councillor we decided to speak to another Councillor. This Councillor was also active in the New Era Estate case. He was very proactive and after some investigation found an email from Family Mosaic to Hackney Council sent in 2014. In the email he sent to us it stated, ‘Over time Family Mosaic considered that the model no longer worked effectively and achieved best value for the Council’. The language used illustrated that Family Mosaic had decided a while ago that they no longer wanted to provide the service. It was not linked to the 2015 elections, £85 million cuts or 10% cuts as we were told in our redundancy meetings. Instead the election and figures were used to finally end the historically unwanted service. This would later be corroborated in my redundancy appeal. None of the adults we supported were consulted about the changes. I brought this matter up in my appeal because I was very angry when I read this statement. I was told that a member of Hackney spoke to a group of adults at a tenants meeting. I was told that it was not clear if all the affected adults were at the meeting because it was difficult to get everyone together. I was even told that the word consultation was used in a very loose manner. The reason given for there not being a proper one-to-one consultation was because the adults were vulnerable. The adults we supported were vulnerable, and there were varying levels of abilities, but they were not stupid and when they found out about the redundancies they wanted to know why they were not consulted. One of Family Mosaic’s selling points is that they consult their customers, putting them central to the conversation. Again the council was told we were provided with rent-free accommodation. As already stated all support tenants paid monthly rent and we all had a tenancy agreement. Next the council was told that service users would be provided with more support hours. This would be wonderful if it were true but we were told the hours given to service users would remain the same. In my redundancy appeal I was told that they used the wrong wording. Language is a very powerful tool. In this case it is possible to surmise that language effectively manipulated the reader. The Councillor was concerned and said he would make his own inquiries. He asked if he could use my name when making those inquiries and I agreed. He suggested that we met another Councillor this time the Commissioner. A meeting was organised. The day of the meeting our manager phoned us and left separate messages telling us not to visit the Councillor. Fifteen minutes before the actual meeting the director emailed and told us not to attend the meeting. He said he knew we were meeting the Councillor and we were with a service user and this could be seen to be misconduct. He ordered us not to go. We were not with a service user and it was our democratic right to meet our local Councillor. We were losing our homes, we needed assistance so we attended the meeting. We told the Councillor about Family Mosaic’s conduct. He felt it was heavy handed of them and said he would speak to them and ask for more time in the accommodation on our behalf. His suggestion was a year as that would give us more time to find another job and a home. Five minutes after leaving the meeting another email came from the director who said he knew we had attended the meeting and that we ought to go to the main office for a meeting with management. How did he know about the meeting? Who was informing on us and why? Wasn’t the sharing of information a breach of our data protection? My colleague emailed the Councillor asking these questions. We never heard from him personally again. We forwarded the emails to our trade union rep. The next morning another text message from my manager about my conduct. It was the same for my colleague. Over the following days there was a succession of messages from the director. We were advised by our union rep to file for harassment and bullying grievance. We also asked for all data from the company relating to the change in service and my tenancy. The harassment stopped. The actions of the Council member put us in a very vulnerable position. Whilst the bullying and harassment caused us a lot of distress. It was another example of the power imbalance within the work place. From the point of view of the director his actions illustrated well the modern master slave dialectic. He did not see us as conscious beings rather we were objects bound to him through contract and thus subjugated to his will. From the point of view of the workers the slaves were dissenting. Next week will be the final chapter. This will be followed by an afterword and notes on what happened because of this blog. Thank you for reading, sharing & donating. Tags: eviction. Bookmark the permalink. The next morning another message about my conduct.Three workers were affected by the redundancy. Shocking news.